Rosacea is a common chronic, inflammatory disease of the face. It is characterised by redness and red bumps (papules) on the cheeks and possibly the forehead, cheeks, chin and nose. It also sometimes affects the eyes. Adults, especially women between the ages of 35 and 50, are mostly affected. However, the condition occurs in both sexes and among people of all ages and skin types (even though there is a slightly higher risk among people with fair skin). The exact cause of rosacea is unknown, but it is believed that several factors may be involved. It has been suggested that environmental and genetic factors may play a role and some researchers believe that blood vessels which expand too easily may be a causative factor. BroadBand Light BBL ™ is an effective treatment for managing the condition. Patients can go through life with normal, healthy, even-coloured skin. Amazing, light based technology works to erase many of the unwanted signs of Rosacea. This effective technology allows light to pass through surface skin cells, destroying unwanted pigmentation and blood-vessels. 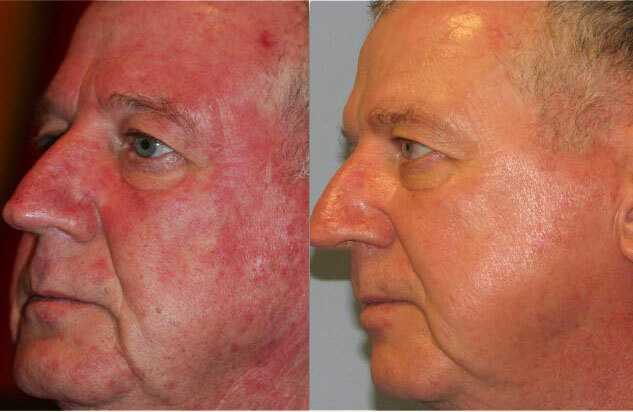 The end result of this treatment is a noticeable decrease in unwanted signs of Rosacea. Your skin tone will immediately become clearer, and the redness will disappear. These state of the art laser skin treatments utilizes Broadband Light to destroy the surface, unwanted blood-vessels that accompany Rosacea. Although there is no permanent cure for Rosacea, BroadBand Light BBL ™ is an effective treatment for managing the condition. Patients can go through life with normal, healthy, even-coloured skin. 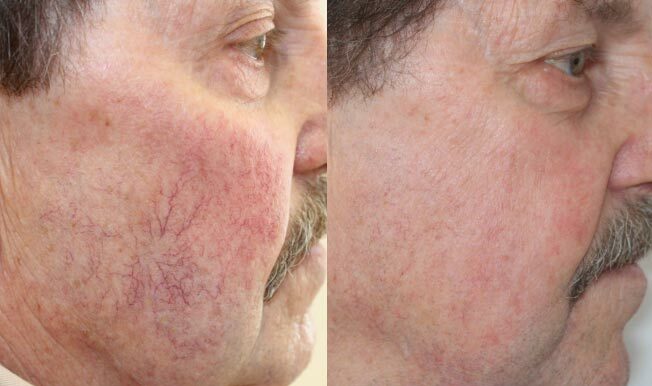 HOW DOES ROSACEA LASER TREATMENTS WORK? Our Rosacea treatments work by exposing the compromised skin to light which destroys the numerous surface veins that make up Rosacea. The net result is the reduction of surface redness, broken blood vessels, splotchy skin colour, and sun-spots. HOW MANY TREATMENTS ARE NEEDED TO MANAGE ROSACEA? On average, 3 to 4 BroadBand Light BBL ™ treatments are needed to clear-up current Rosacea. These treatments are relatively quick, treating the entire face takes about 30 minutes. Most patients describe the treatment as feeling similar to a quick rubber-band snap against the skin. Although not necessarily a pleasant sensation, the treatment is over so quickly that everyone has an easy time getting through it. For the more sensitive, taking an over-the-counter anti-inflammatory (such as Aleve or Motrin) 30-45 minutes before treatment can help alleviate any discomfort. WHAT WILL I LOOK LIKE IMMEDIATELY AFTER A ROSACEA TREATMENT? 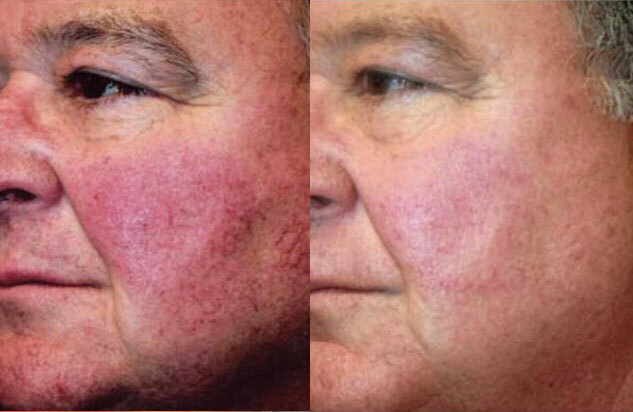 One of the most satisfying things about these Rosacea laser treatments is that the results are almost immediate. After one week post treatment you will notice a decrease in skin redness, which will continue to improve over the following 14 – 28 days. Unfortunately, these treatments do not permanently cure Rosacea, and instead they are just a way to control and manage it. Maintenance treatments will be needed, but the frequency will depend largely on how you care for your skin in the meantime. Those with Rosacea should avoid any known triggers, such as sun exposure, spicy food, red wine, and over-heating. In addition to performing the treatments, we are also happy to help advise on a proper at home regimen and provide tips and tricks for best managing your Rosacea.